The conductor Alvaro Cassuto has made it a lifelong mission to bring the music of Portugal’s orchestral composers to the world stage. This he did most notably with a sequence of Marco Polo discs of Joly Braga Santos’s six symphonies. Before that he had recorded discs of related repertoire for the Portusom label. Anyone with a taste for the orchestral music of Vaughan Williams and Moeran should give these works a try. 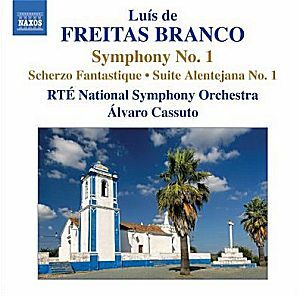 Much the same can be said of the four symphonies of another Portuguese composer, Luis de Freitas Branco who was born into the most comfortable of surroundings in the city in which he spent most of his life, Lisbon. He studied in both Berlin and Paris. His teachers included Engelbert Humperdinck. The Symphony No. 1 has the stamp of the symphonies by César Franck and Paul Dukas. This can be heard in the excitable lyrical release of the first movement. It is also there unmistakably in the explosive opening of the finale of this three movement work. However de Freitas Branco also infuses oxygen into Franck’s sometimes suffocating harmonic scheme. There are some lovely fresh and radiant touches throughout this fine work and echoes of L’Apprenti Sorcier and of RVW’s The Wasps overture. The engraved life-enhancing melody in the first movement (2:21) is irresistible. The second movement recalls the serenity of Rodrigo’s Aranjuez yet has a late nineteenth century patina. Again we hear a long and lambent melody heavy with benediction and kindliness. The Scherzo Fantastique was written when the composer was only seventeen. It is magically scored in the manner of the Parisian ballet tradition of the 1890s. The work shows a light hand with a delicacy learnt from the best of Massenet and Berlioz. There are two orchestral suites inspired by the indigenous countryside music of the Alentejo region south of Lisbon. The three movements of the First Alentejana Suite are reminiscent of Vaughan Williams yet with a warmer Southern accent. The first two movements revel in the mists and nuances of landscape. The finale draws heavily, enjoyably and with unblushing candour on the examples of Chabrier’s España and Massenet’s ballet music from Le Cid. It combines brilliance of display with a noble and faintly ecclesiastical melody. Alvaro Cassuto provides the liner-note for this disc. The Portusom discs are no longer available so these are the only game in town. However they are in any event presented by an orchestra able to bring more polish than the motley yet passionate Hungarian bands used by Portusom. Fine early twentieth century melodic Portuguese music with nationalist Franckian inclinations, an open air gloss and lashings of the oxygen of the warm countryside. May the remaining three volumes be not far behind as the passion of these performances encourages further exploration – further discovery. Joly Braga Santos: Symphony 2; Symphonies 3 and 6; Symphonies 1 and 5; Symphony No. 4; Concerto for Strings.